R* turned eleven last month. 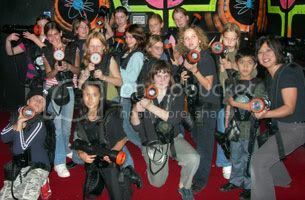 Here's a picture of her with her friends at her laserquest party. K* scored the highest number of hits by camping in a corner and shooting everyone. Jenny played one of the games as its not everyday you get to shoot children! I'm sure, like every other parent, when a birthday comes along you also reflect at how much and how fast your child is growing up. Some of her friends are almost as tall as Jenny and they're growing lumpy bits! Woah. At least they all still seem to think kissing is disgusting despite rumours about what happens on the bus. Nevertheless, she's gradually getting more independent. R* recently quit St. John's Ambulance and instead has joined Sea Cadets. It's definitely more exciting and she's very enthusiastic. For a kid who's been raised in environments that celebrate individualism, it's been a bit of surprise that she's embraced the authourity, structure and discipline of Sea Cadets. I think part of it is the "grown-up" nature of the group. So we have a girl marching around the house now. As for activities, she still plays the cornet and is in a beginners brass band. She's recently joined the school choir and she still has her weekly swimming lessons. I made her join a team sport and she chose basetball after unsuccessfully trying to convince me that chess is a team sport. We even had to consult the dictionary of the difference between "sport" and "game". But she's dropping it next term. She's not a sporty kid. Can't blame her with such pathetic role models as her parents. She isn't into any hobbies in any big way. Between homework and after-school activities, she really doesn't get much time. She recently got interested in Warhammer and is collectiing a Dwarf Army. She likes fantasy world stuff and gothic jewellery. While not a girlie girl, she does like jewellery of all kinds. She wants a dog, laptop and mp3 player. No. no. maybe.